If you haven’t tried Dr. Bronner’s Magic Soaps, you are missing out! I love these liquid organic soaps, they are so versatile and totally natural; however, it took me some time to actually give them a try. I first saw them in a few shops and read some good reviews online but I wasn’t sure whether I actually needed this kind of stuff. I finally decided to buy a couple of bottles from TK Maxx since they were reduced and they didn’t disappoint me. Recently, I also got sent some PR samples so now it’s about time to tell you what I really think about these magic soaps so you can see for yourself whether you actually want to give them a try (if you haven’t already). Dr. Bronner’s Magic Soaps are vegan, cruelty-free soaps with ethically sourced and certified fair trade ingredients. The soaps are also certified organic under the USDA National Organic Program. Dr. Bronner’s liquid soaps have so many different uses, making your life easier as you don’t have to buy several different products for different purposes when you only need one. They are pretty good value for money as well as they are really concentrated, meaning that you don’t need to use a lot so one bottle could last you a long time. The main two ingredients used in Dr. Bronner’s soaps are coconut and olive oil and the right ratio of both oils has to be used to create a high-quality liquid castile soap which will lather well and have superb softness on the skin. 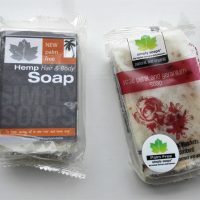 Hemp and jojoba oils are also present in all the soaps as they mirror the natural oils in the skin’s sebum and therefore helping to make skin soft after the soap has been washed away. Dr. Bronner’s Magic Soap comes in 9 scents and each bottle differs from another by different fragrance/extract they put in it. It’s claimed that Dr. Bronner’s soaps can be used in 18 different ways – for example, you could use Dr. Bronner’s organic soap for body washing, hair washing, all-purpose cleaning and even for scrubbing toilets! You can find all the different uses here. You have to keep in mind though that Dr. Bronner’s soaps are highly concentrated and you should use them diluted. Lisa Bronner has created a little guide to help you with dilutions, check it out here. At home, I currently have Dr. Bronner’s Rose, Tea Tree and Lavender liquid soaps with the lavender scent almost finished. 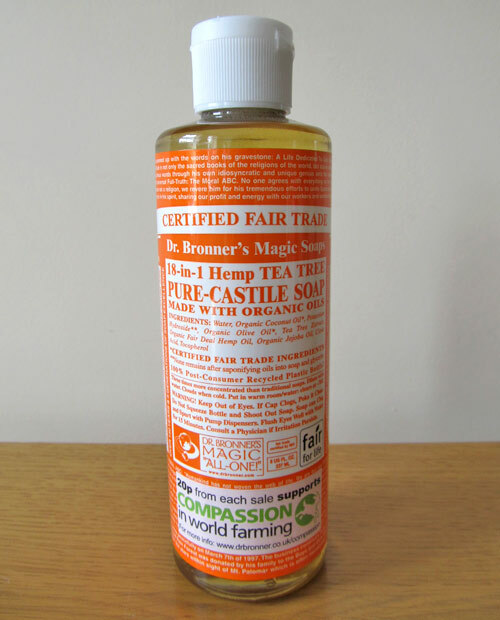 Dr. Bronner’s Tea Tree magic soap has a strong tea tree scent, making it my least favourite Dr. Bronner’s soap, but I am aware of the benefits of tea tree, so I am using it accordingly. Tea tree has great anti-bacterial and antiseptic properties, therefore Dr. Bronner’s Tea Tree magic soap is great as a hand wash and this is how I’ve been using it most of the time, diluted of course. I also find it great for washing my make up brushes, comb and other stuff that I believe needs some anti-bacterial treatment. In the past, I also used Dr. Bronner’s Tea Tree magic soap to create a multi-purpose cleaning product to clean the kitchen surfaces and bathroom. It works great like that but as it’s such a great product I somehow don’t want to use it for cleaning these days, I’d rather put it to use in other ways and use other products for cleaning. But well, it’s always an option if I run out of my usual cleaning products. While I am not new to Dr. Bronner’s Tea Tree soap, it’s the first time I’ve been trying Dr. Bronner’s Rose liquid soap. I quite like the scent and I’ve been using it for hand washing my cycling clothes. Surprisingly, it works really well for hand washing – it removed all the greasy sun cream stains, leaving the clothes with the lovely scent. I’ve also been adding it to my laundry to replace some of my normal laundry liquid, just to give the clothes nice scent and to help shift any stains. Although you can use Dr. Bronner’s magic soaps in so many different ways, I believe that not all the scents work well for every single purpose. While I could easily wash my clothes with the tea tree scented soap, I prefer not to do that, as I don’t want my clothes to smell of tea tree, I’d prefer if they smell of rose, lavender or citrus. In the past, I also used lavender scented soap from Dr. Bronner’s for laundry and it seemed to have worked well for this purpose. I am yet to try the citrusy scent and I have a feeling it’s pretty good. What I don’t think these soaps work well for is hair washing. I tried it once and it’s difficult to explain but my hair definitely didn’t feel soft afterwards and it was pretty difficult to manage. Dr. Bronner are aware of this effect and if you look at the FAQs on their website you will see that they recommend using an acidic conditioning rinse after washing the hair (apple cider vinegar could work for this I believe). Lisa Bronner also wrote an article about her honest experience when using Dr. Bronner’s organic soap as a hair wash and you can read all about it here. After reading it I am actually thinking to give it another try. Just to mention, not all Dr. Bronner’s liquid soaps are scented, as I know that some of you may be sensitive to fragrance or essential oils. There is actually a baby unscented version of Dr. Bronner’s Magic Soap. This version has double the olive oil and is suitable for sensitive skin. Where to buy Dr. Bronner’s liquid soaps from? 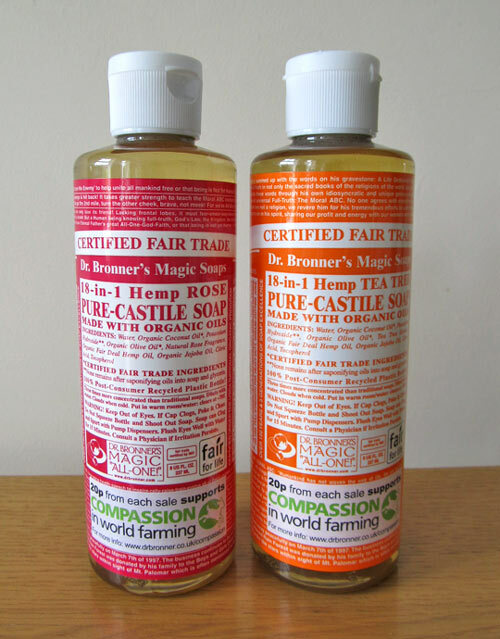 Today there are so many places where you can buy Dr Bronner’s liquid soaps from – check TK Maxx first, I’ve seen them there on sale many times before so this is a good place to start. You can also buy them on Dr. Bronner’s website, on Amazon (free delivery) and several other natural health and beauty websites. Would I recommend Dr. Bronner’s Magic soaps? Yes, definitely yes! They are organic, good quality, eco-friendly and you can use them for so many different purposes. This makes them great for travelling, hiking and camping. No need for several different products when all you need is one small bottle! But remember that not every single scent is a perfect fit for every single purpose, some scents are better suited for particular purposes than others. Before you buy it, think about what you want to use it for. This will help you determine the choice of fragrance/scent but of course, you could always buy several different scents and use them for different purposes if you wish. Have you tried Dr. Bronner’s soaps before and what did you think? If not, will you be giving them a try? I love Dr. Bronners liquid soaps. In fact, Dr. Bronners Peppermint Castile Soap is the only soap I have used for years. It is so mild, refreshing and amazing. Thanks for sharing your review of Dr. Bronners liquid soaps. I’m pinning and sharing. I also subscribed to stay in touch. I haven’t tried the Peppermint scent yet but will definitely try it in the future, great to see you are a fan as well and thank you for sharing and subscribing Deborah! I also love Dr Bronner’s soaps and the fact that you can use them for many different things. I did try washing my hair with them but I still prefer using my usual shampoo. However, they are great for travel or camping!